Bet on any soccer action from 4 March to 28 April, and you’ll go into the draw to win a trip for two to support Kenya as they take on Africa’s best in Egypt. There will also be weekly Free Bet, cash and smartphone prizes up for grabs. The promotion is only open to persons who are natural persons, 18 years or older, and either Kenyan citizens or permanently reside in Kenya. 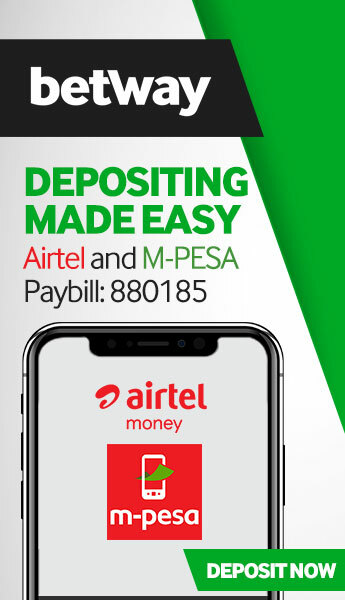 Please also visit www.betway.co.ke for a full list of terms and conditions. On your first deposit at Betway, we'll give you a 50% deposit bonus up to KSh 5,000 awarded as a Free Bet. This bonus only requires 3x playthrough at odds of 3 or higher on Sports,Virtuals and Jackpots. Bets placed on casino and betgames do not contribute to fulfilling opening offer requirements. The Betway Welcome Bonus awards customers with a 50% deposit bonus up to KSh 5,000 awarded as a Free Bet. The maximum return on any Free Bet is KSh 30,000. Take part in Betway’s new, exciting and free weekly prediction game. Simply predict the first teams to score in four soccer divisions and you could win KSh 500,000. If no winner is eligible during a week, the prize will roll over, adding KSh 100,000 every week up to a maximum of KSh 1,000,000. 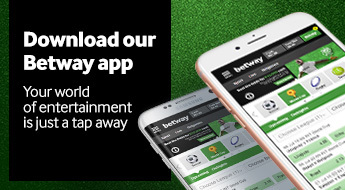 A valid Betway account is required to participate in the promotion. Entrants must be legal Kenyan citizens and be over the age of 18. The total prize pot for each round of matches is KSh 500,000 unless stated otherwise. This prize is shared amongst winners in Uganda, Ghana, Nigeria, Kenya, South Africa and Zambia. If a Round has no winner, the jackpot will roll over to the following one with an additional KSh 100,000 added to the total. For example, if there is not a winner in Round 1, the prize pot for Round 2 will be KSh 600,000. This will occur until a KSh 1,000,000 maximum prize is reached. Invite a friend to join Betway and we’ll reward you with a KSh 50 Free Bet. This promotion is open to all customers with an active Betway account. On successful registration your friend must make a deposit and then place a minimum of 3 wagers KSh49 or more. The promotion is not open to people who are not natural persons and citizens of Kenya residing within Kenya at the time of their entry into the promotion. Which London club do you think will finish above the rest with the remaining fixtures coming up? A second place prize draw will be done where 10 winners will receive KSh 250 in Free Bets each. To qualify for the second prize Free Bet of KSh 250, entrants need to place at least one Outright bet on Top London Club (Arsenal, Spurs and Chelsea) between now and 12 May.